With 30+ years of experience in photonics, electronics, metrology and other interrelated sciences, HHR Lasers, Inc. is equipped to handle your gas laser refurbishment, sales/service and consulting needs. But you'll find that our services here at HHR cater to more than just cut-and-dried laser industry clientele. We're talking about laser light shows and holographic art. Both of these fields have gone from obscurity only a couple of decades ago to nowadays literally invading today's arena of multimedia, entertainment and fine art. Indeed, having developed out of once-fringe laser research to being full-blown facets of our industry  viz, beam scanning and holographic media technologies  the art of laser image projection has truly come of age. Well, HHR has been there from the beginning. 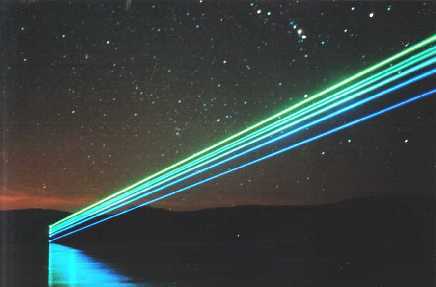 Ever since 1972 when as high school students we initiated, set-up and produced our own laser holograms . . . shot on the school physics lab's very first light table. The fact is, we've always specialized in selling and servicing the laser light sources that high-tech laserists and holographers like you need. That includes both multi- and single line platforms, i.e. white light air-cooled units, and medium- to high-powered HeNe and argon ion systems, respectively. For further details, just call or e-mail us.